Two miles down a dirt road sits our little home, as the road twist and turns it moves deeper and deeper into the woods, tree branches reach over to touch one another creating a tunnel, the sunlight dances in the shadows, a smiling face on an ancient oak greets you as your round the turn welcoming you to our home. A playsilk was one of the first toys I purchased for Eoghan. I drapped it over his basinet, let him grasp it, chew on it, played peek-a-boo, and covered him up with it, and even tied little knots in it to fashion a doll. His "silkie" quickly became his favorite toy. Almost 2 years later we still play with that "silkie" daily. There is something luxurious about playing with silk. I love watching it float down as we spread it out over the table to set up for story time, taking a few minutes to pause and watch it flutter really sets the tone, for the magic of our story. Our silkies have been used as landscapes and backdrops to our stories, soups in our play kitchen, blankets and carriers for our dolls. They have created forts, provided curtains for puppet shows, have been fashioned in to all sorts of clothing for dress up, and even become mighty rivers in our movement journeys! I really believe playsilks are one of the best investments one can make in a toy that will provide years of entertainment for a child. There are so many beautiful playsilks available on Etsy and I too have begun offering them for $5 in my Etsy Shop for those of you who don't want to have to deal with boiling pots of hot water and dyes all over your counters! You can however easily make them yourself and I think watching the colors come out is half the fun. I purchase the undyed silks from Dharma Trading Company and have tried a few different types of dyes, from Kool-aid to coffee beans all of which creating wonderfully beautiful silks! There are some great tutorials online on how to use different dyes with playsilks so I won't bother to post the step by step process here. But my most recent batch I did a little differently than I have seen suggested online. I dyed with Coffee first allowed them to dry fully then gave them a second dye bath in water tinted with food coloring. I really love the way the colors came out a little more earthy with the coffee base. I think on my next batch I may reverse the process and do the bright dyes first then give them a coffee bath and see what the difference is. 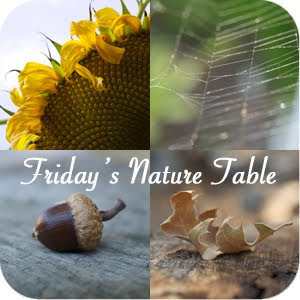 Shared on Friday's Nature Table at the Magic Onions.